Your mouth contains germs that can cause your baby to get tooth decay. Your baby can catch germs from your mouth from contact with your saliva. Do not share spoons, cups or toothbrushes with your child. Avoid cleaning his/her pacifier with your mouth. Start cleaning baby teeth as soon as they come into the mouth – usually around age 6 to 10 months. Use a baby toothbrush with a small amount of fluoride toothpaste the size of a grain of rice. Brush twice a day: once in the morning and once at bedtime. You can brush your child’s teeth anywhere – not just in the bathroom. It can be easier to brush a baby’s teeth while he/she is lying down on a changing table or on the floor. Toddlers can have their teeth brushed while sitting up in a chair or while standing in front of you in the bathroom. Some children do not like having their teeth brushed. It’s OK if they cry because wide-open mouths make brushing easier! Gently brush your baby’s teeth. Remember that it’s the fluoride in the toothpaste that makes the teeth stronger and prevents and even reverses early tooth decay. Even newborn babies need to have their mouths cleaned. Before your baby has teeth, gently wipe the gums clean with a clean, damp washcloth each day. Introduce a sippy cup when your child can sit up on his/her own. Limit juices, breast milk and formula to mealtime only. If you put your baby to bed with a bottle, fill it with water only. Milk, formula, juices, soda and breast milk all have sugar in them that can puddle around a sleeping baby’s teeth, causing tooth decay. Fluoride is Great for Teeth! Is a form of fluoride that is applied to the surface of the tooth, much like polish is applied to fingernails. Is safe and effective. 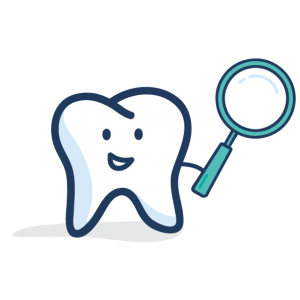 Recent studies have shown that there are no adverse events with fluoride varnish applications. Since it is topical, the amount of fluoride absorbed is minimal, equal to brushing with fluoride toothpaste. Stays in contact with teeth and helps to prevent them from getting tooth decay. It can even reverse early tooth decay! Is something that your child should have applied 2-4 times a year but at least four times before age four years. Ask your child’s medical doctor, dentist, dental hygienist or nurse to apply fluoride varnish to protect your child’s teeth. Click here for information from the American Academy of Pediatrics. A medical doctor or dentist may prescribe fluoride supplements for your child. Fluoride supplements come as tablets, drops or vitamins and need to be taken once per day. They help the body fight tooth decay from both inside and outside of the tooth. Fluoride supplements are only for children whose water supply lacks fluoride. Ask your child’s medical doctor or dentist about fluoride supplements if you think your child may need them. Almost all water has some fluoride in it naturally, but usually the levels are too low. Many communities adjust the fluoride levels of their water to prevent tooth decay. If you have public water, click here to find out if your water is fluoridated: Connecticut, Maine, Massachusetts, Rhode Island. If your home has a well, you can have the water tested to find out if your child is getting enough fluoride to help prevent cavities. Click here to find out how to test your well water: Connecticut, Maine, Massachusetts, Rhode Island. At your next visit, be sure to ask your child’s medical doctor or dentist about fluoride.